Mother-child cohort studies have established that both pre-pregnancy body mass index (BMI) and gestational weight gain (GWG) are independently associated with cardio-metabolic risk factors in juvenile and adult offspring, including systolic and diastolic blood pressure. In rodent studies maternal obesity confers many facets of the metabolic syndrome including a persistent sympathy-excitatory hyperresponsiveness and hypertension acquired in the early stages of development. Insight from these animal models raises the possibility that early life exposure to the nutritional and hormonal environment of obesity in pregnancy in humans may lead to early onset of metabolic syndrome and/or essential hypertension. 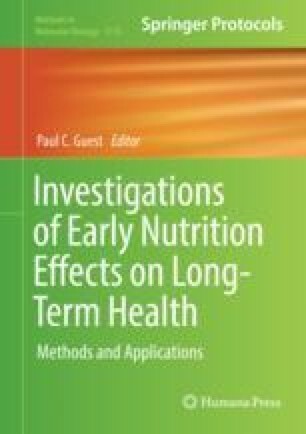 This chapter will address the development of rodent models of maternal overnutrition and obesity, which have proved invaluable in generating testable hypotheses for clinical translation and the development of intervention strategies to stem the swelling tide of obesity and its comorbidities predicted for future generations. This work was funded by the British Heart Foundation and the EU Framework 6 Project, EARNEST.